Get the great tremolo tones of the '50s and '60s. 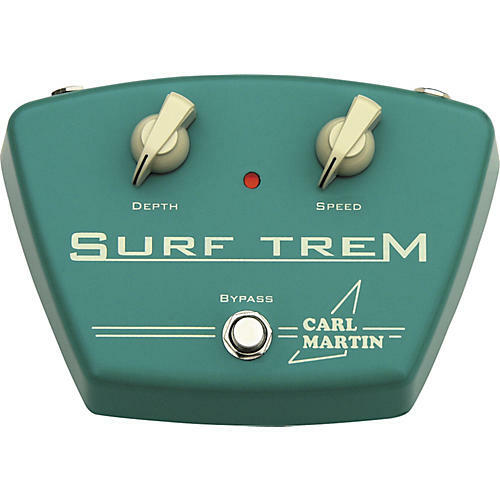 The Surf Trem gets its tremolo circuit from the Carl Martin Tremovibe. With just speed and depth controls (just like an old tube amp), those classic tones are easy to achieve. The Surf Trem features a retro heavy die-cast case with 9V battery compartment, cool color, and heavy-duty bypass switch. For the slow song with a lot of drama in the tone, tweak the depth knob up and set the speed to match the tempo of the song. To give the guitar a subtle timbre or vibe, go easy on the depth knob and set the speed fairly high. This gives a light effect that can be used very often, as it will not dominate the song with a heavy character. Set both the depth and speed knobs high and use together with a fairly high-gain drive for a very powerful effect. Order this cool retro effects pedal today!